Get-FileReport function creates detailed file report and exports it into CSV format. Dot Source PowerShell Function in Profile – Type dot and the full path to the ps1 file. A comment based help is included. Use Get-Help Get-FileReport -full to retrieve the details bellow. Specifies the target folder path. Scans the files recursively. Exports the results in CSV file. Specifies the folder path for the export file. Returns the properties of all files under c:\backups. You can use (Get-Help Get-FileReport).Examples from the console to retrieve the examples. This function creates detailed file report and exports it in CSV format. Use this function to export properties for files of certain type (doc,txt,jpg,etc. ), and files older than certain days. Returns all files under c:\backups older than 1500 days. The maximum value is 15000. Returns all .txt files under c:\backups older than 150 days. Exports to CSV all .txt files under c:\backups older than 150 days. File Share Quota Management Tool is a powerful menu based PowerShell script used to remotely control the amount of disk/storage space that a user can utilize on the file server. 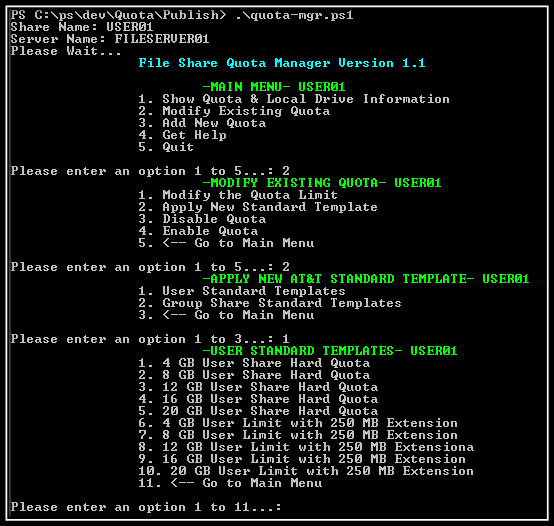 Quota manager tool will help system administrators to create, modify, enable or disable quotas on remote file servers. The user-friendly navigation through the menus and the ability to remotely manage the quotas can save tremendous amount of time spent on manual quota processing during our daily admin tasks. This tool is extremely helpful for managing file quotas on Windows servers with no PowerShell FSRM module support (which comes with Windows Server 2012). The script leverages the command-line FSRM utility dirquota and requires PSRemoting enabled on the target systems. -Uncomment line 51. The script will resolve server’s hostname form the DNS. To use FQDN type in the DNS suffix. For retrieving the local disks information (lines 75,77) I used filtering to exclude all possible drives that I don’t want to monitor. Those are system drive, Quorum disk, drives that do not support any active shares. You may want to adjust this filtering to fit with your environment configuration. To change the standard quota templates use Find/Replace. Menu enabled quota manager. Leverages the FSRM dirquota command line tool. Requires PSRemoting enabled on target servers. $sharename = Read-Host "Share Name"
$virtualname = Read-Host "Server Name"
$servername = $virtualname #Comment out if your input is a virtual server name. #Uncomment the following line if your input is a virtual server name. It will resolve the server's hostname and add the DNS suffix. #$servername = (get-wmiobject Win32_computersystem -computername $virtualname).DNSHostname + ".yourdomain.com"
Write-host "`t`t1. Show Quota & Local Drive Information"
Write-host "`t`t2. Modify Existing Quota"
Write-host "`t`t3. Add New Quota"
Write-Host "Local Disk Information for $sharename"
Write-Host "Possible New Location on $virtualname"
Write-host "`t`t1. Modify the Quota Limit"
Write-host "`t`t2. Apply New Standard Template"
Write-host "`t`t5. <-- Go to Main Menu"
$NewLimit = Read-Host "Enter New Limit(GB)"
$ModifyLimit = dirquota q m /p:$localpath /limit:$NewLimit"GB"
Write-host "`t`t1. User Standard Templates"
Write-host "`t`t2. Group Share Standard Templates"
Write-host "`t`t3. <-- Go to Main Menu"
Write-host "`t`t1. 4 GB User Share Hard Quota"
Write-host "`t`t2. 8 GB User Share Hard Quota"
Write-host "`t`t3. 12 GB User Share Hard Quota"
Write-host "`t`t4. 16 GB User Share Hard Quota"
Write-host "`t`t5. 20 GB User Share Hard Quota"
Write-host "`t`t6. 4 GB User Limit with 250 MB Extension"
Write-host "`t`t7. 8 GB User Limit with 250 MB Extension"
Write-host "`t`t8. 12 GB User Limit with 250 MB Extension"
Write-host "`t`t9. 16 GB User Limit with 250 MB Extension"
Write-host "`t`t10. 20 GB User Limit with 250 MB Extension"
Write-host "`t`t11. <-- Go to Main Menu"
dirquota q m /p:$localpath /sourcetemplate:"4 GB User Share Hard Quota"
dirquota q m /p:$localpath /sourcetemplate:"8 GB User Share Hard Quota"
dirquota q m /p:$localpath /sourcetemplate:"12 GB User Share Hard Quota"
dirquota q m /p:$localpath /sourcetemplate:"16 GB User Share Hard Quota"
dirquota q m /p:$localpath /sourcetemplate:"20 GB User Share Hard Quota"
dirquota q m /p:$localpath /sourcetemplate:"4 GB User Limit with 250 MB Extension"
dirquota q m /p:$localpath /sourcetemplate:"8 GB User Limit with 250 MB Extension"
dirquota q m /p:$localpath /sourcetemplate:"12 GB User Limit with 250 MB Extension"
dirquota q m /p:$localpath /sourcetemplate:"16 GB User Limit with 250 MB Extension"
dirquota q m /p:$localpath /sourcetemplate:"20 GB User Limit with 250 MB Extension"
Write-host "`t`t1. 10 GB Group Share Hard Quota"
Write-host "`t`t2. 20 GB Group Share Hard Quota"
Write-host "`t`t3. 30 GB Group Share Hard Quota"
Write-host "`t`t4. 40 GB Group Share Hard Quota"
Write-host "`t`t5. 50 GB Group Share Hard Quota"
Write-host "`t`t6. 10 GB Group Limit with 250 MB Extension"
Write-host "`t`t7. 20 GB Group Limit with 250 MB Extension"
Write-host "`t`t8. 30 GB Group Limit with 250 MB Extension"
Write-host "`t`t9. 40 GB Group Limit with 250 MB Extension"
Write-host "`t`t10. 50 GB Group Limit with 250 MB Extension"
dirquota q m /p:$localpath /sourcetemplate:"10 GB Group Share Hard Quota"
dirquota q m /p:$localpath /sourcetemplate:"20 GB Group Share Hard Quota"
dirquota q m /p:$localpath /sourcetemplate:"30 GB Group Share Hard Quota"
dirquota q m /p:$localpath /sourcetemplate:"40 GB Group Share Hard Quota"
dirquota q m /p:$localpath /sourcetemplate:"50 GB Group Share Hard Quota"
dirquota q m /p:$localpath /sourcetemplate:"10 GB Group Limit with 250 MB Extension"
dirquota q m /p:$localpath /sourcetemplate:"20 GB Group Limit with 250 MB Extension"
dirquota q m /p:$localpath /sourcetemplate:"30 GB Group Limit with 250 MB Extension"
dirquota q m /p:$localpath /sourcetemplate:"40 GB Group Limit with 250 MB Extension"
dirquota q m /p:$localpath /sourcetemplate:"50 GB Group Limit with 250 MB Extension"
Write-host "`t`t1. 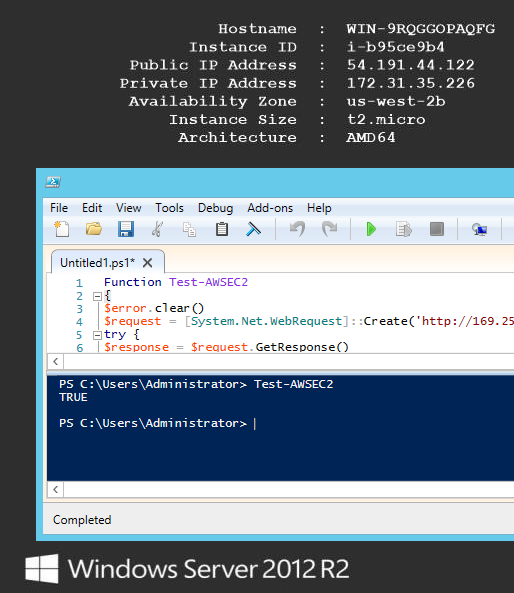 Create New User Quota (4 GB User Share Hard Quota Template)"
Write-host "`t`t2. Create New Group Share Quota (10 GB Group Share Hard Quota)"
dirquota q a /p:$localpath /sourcetemplate:"4 GB User Share Hard Quota"
dirquota q a /p:$localpath /sourcetemplate:"10 GB Group Share Hard Quota"